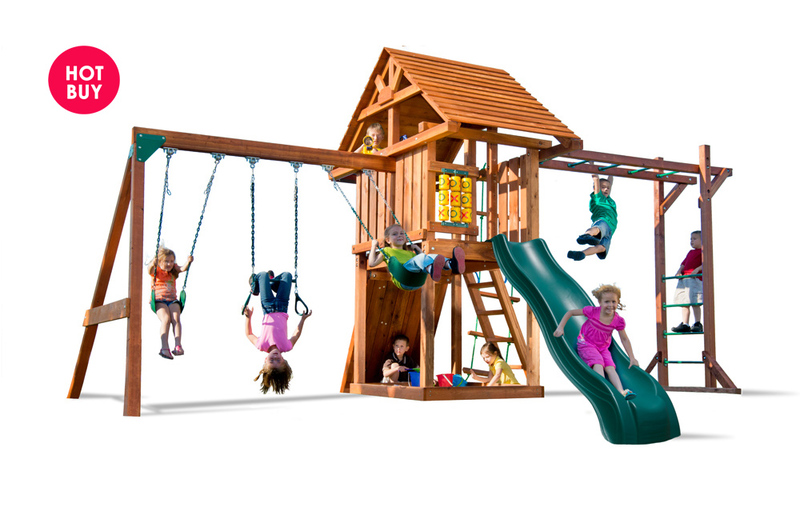 Playset designed to help children achieve the perfect play day - everyday! If you're looking for a fun, affordable and durable wood playset, the Circus Deluxe with monkey bars is the perfect fit. The premium redwood roof provides plenty of shade on a warm summer day and provides admirable backyard appeal. 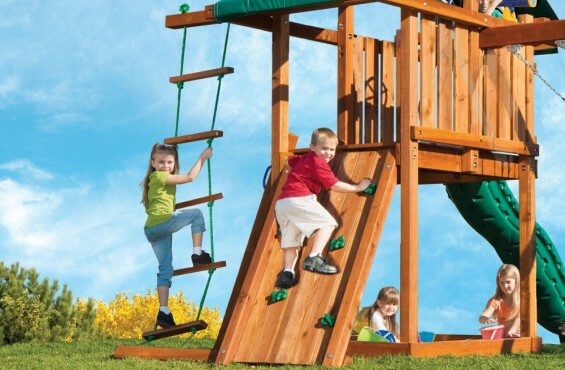 Best of all, the included monkey bars on this playset make this a favorite of parents and children. 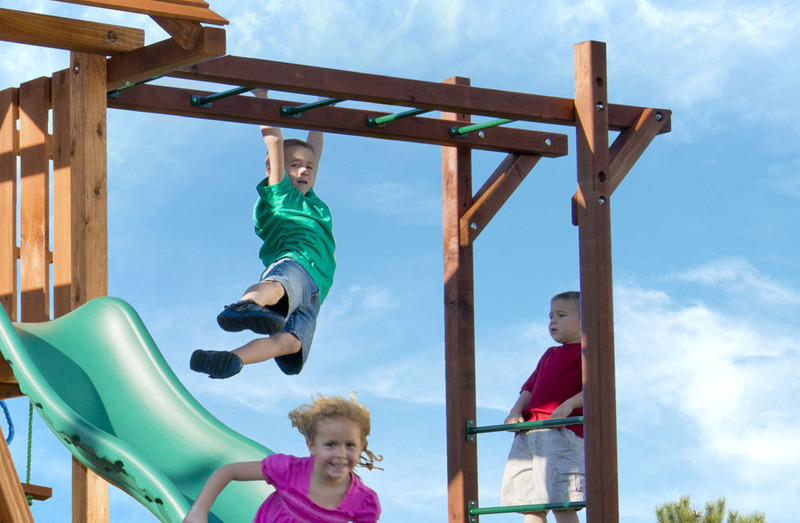 The monkey bars allow children to get the precious exercise their body needs while providing unforgettable memories. 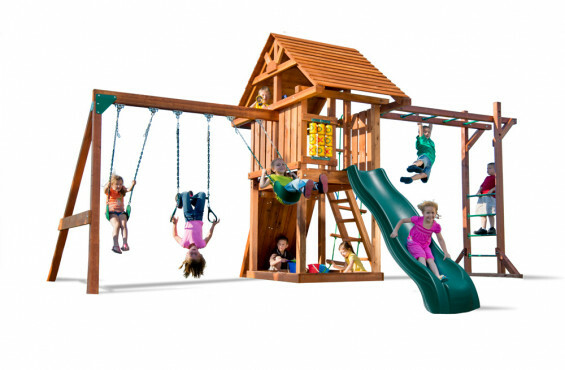 In addition, this playset includes a sandbox, tic-tac toe board, wave slide and much more. The Circus Deluxe with Monkey Bars will put a smile on your child's face and set their imagination to new heights for many years to come. 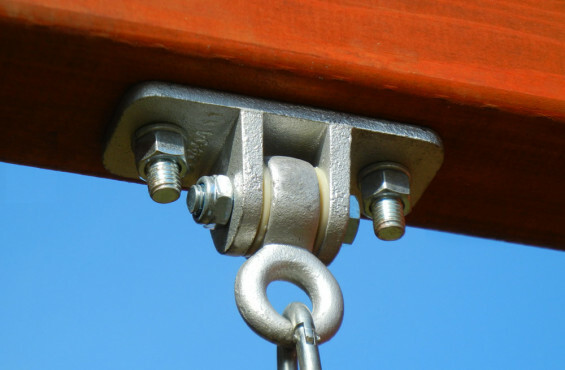 strong>Delivery time: 3-4 weeks for curbside delivery or professional installation. Lead times may vary during peak season and holidays. We design our wood playsets to bring the excitement of the common playground to backyards across America. 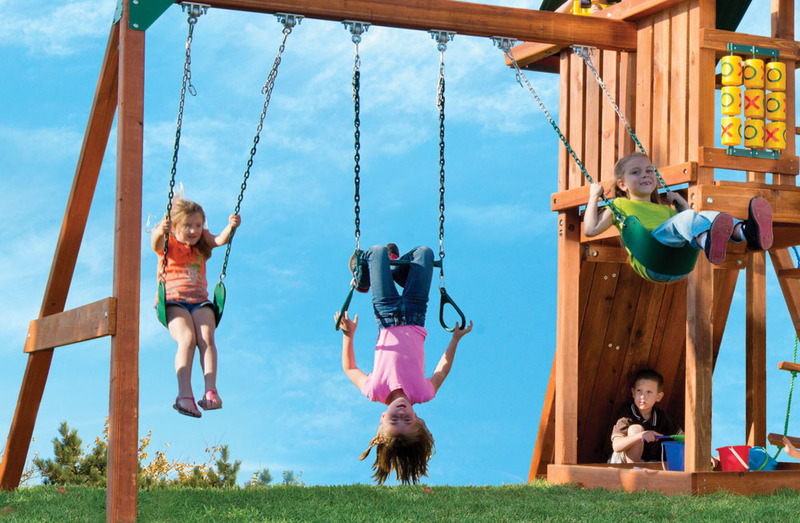 However, we have become the most respected playset manufacturer in the U.S. by putting safety first, always. As an active ASTM safety committee member, we have gone beyond the normal safety guidelines to ensure your children are always safe. 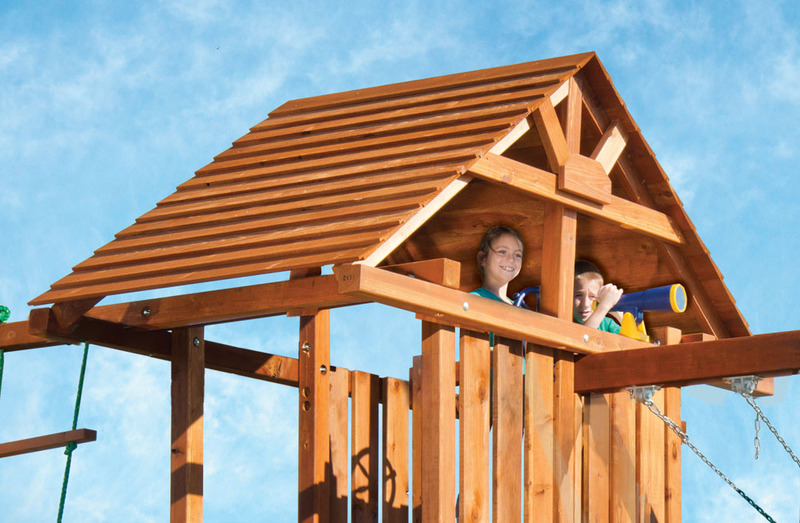 Here are the safety features included on our playsets. While our wood playsets are hand-crafted to eliminate unnecessary cuts and scrapes, we suggest adding a fall surface under your play structure to add another layer of protection for your children – just in case they lose their balance and fall. 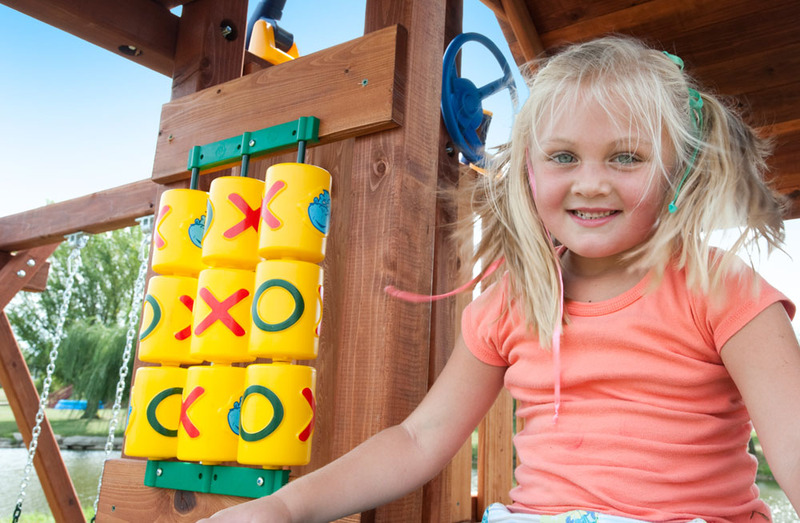 We recommend to add rubber mats, rubber mulch, wood chips sand or pea gravel under your playset. 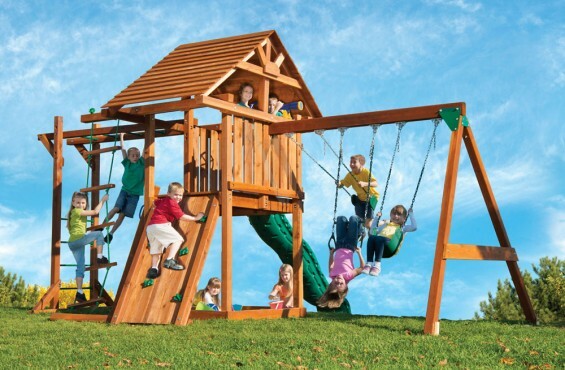 To see a pros and cons list of the best materials for under a playset, check out the resources tab on this page. For a detailed guide on playset fall surfaces, be sure to check out our resources tab on this page. This playset is intended for residential use and is not warrantied for public or commercial use. Before buying a wood playset, always check with your homeowner’s association before assembly. Some HOA’s have height restrictions on building and play structures. Also, determine how much space you have in your yard. Will there be enough space for your children to run around with their friends safely? Once your playset with monkey bars is built and ready to ship from our shop in Monroe, MI, the delivery company will contact you to schedule a delivery date and time. The typical playset will be delivered curbside and comes in multiple bundles/boxes. Some larger packages may need to be opened and hand offloaded to the ground. It might be helpful to have another person help you bring the components into your backyard, but it not a necessity. We welcome anyone to build our playsets, even those with little do-it-yourself experience. 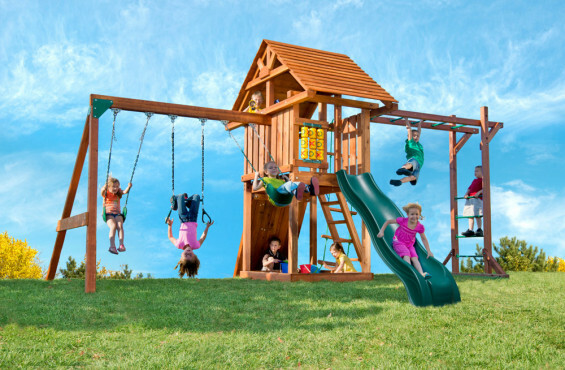 Each children's playset kit is pre-cut, ready for assembly and can be built with basic tools, so you don’t have to be Bob Vila to install our playsets. Actually, parents often comment on how much pride they have building their swing set on their own. Don’t worry, if you have questions during assembly, our dedicated customer service team can answer your questions via phone or online chat. 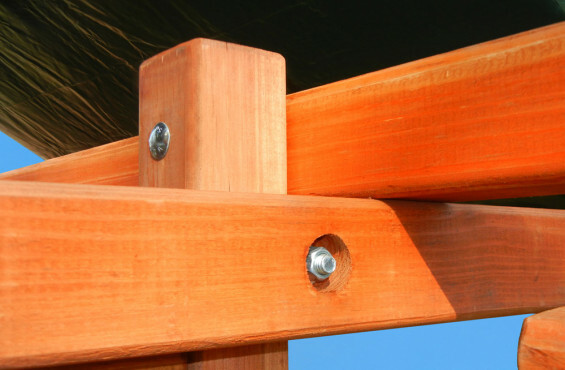 Periodic maintenance is suggested to ensure safe enjoyment of your wood playset and optional accessories. Be sure to check out playset maintenance checklist within the resources tab on this page. We have had our Circus Deluxe with Monkey Bars since 2012. Its a wonderful set and our kids love it. It gives hours of fun to not just our kids but also our neighbors kids. Love it. Very pleased with the product, but very dissatisfied with the delivery and installation. I am currently working with the local branch to repair the bad installation and replace the beams that are damaged. Great swingset. It was built well and my kids love it. We purchased this swing set back in October for a Christmas present. The install team promised a Christmas Eve install wouldn't be a problem and they were right:)They showed up on time and were so nice! The swing set is very well made and worth every penny!! Such a great investment for our 3 girls. This will last for years to come!